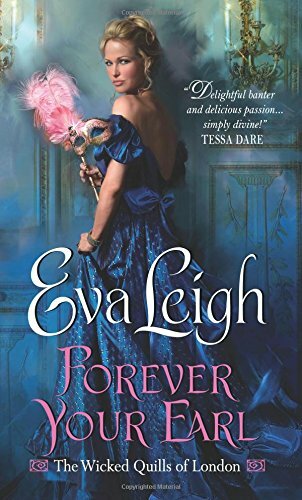 Forever Your Earl is the first book in The Wicked Quills of London series by Eva Leigh. In this book, we meet Eleanor Hawke, founder, creator, and editor of The Hawke’s Eye, a notorious scandal sheet that reports and skewers the goings-on of the upper classes of London. One frequent target of the paper is the notorious Daniel Balfour, the Earl of Ashford. When the earl walks into her office, she thinks he’s there to confront her about what the Hawke’s Eye has written about him. Instead, he issues an irresistible proposal-he will allow the Hawke’s Eye exclusive access to his life and let them report on his comings and goings. What happens next is a fast paced story as we follow Eleanor and Daniel on a madcap adventure. However, it quickly becomes apparent that Daniel has an ulterior motive for making his offer to Eleanor. He is on a secret mission, and is hoping to throw Eleanor off the scene by keeping her attention, and the attention of the ton, off his true objectives. Daniel is in the middle of a desperate search for one of his best friends, the heir of Duke of Holcombe. I liked that Daniel doesn’t live up to his “rakish” reputation. Instead, Eleanor and the reader come to see Daniel as a man of depth, sincerity, and most of all, loyalty. Daniel is a man Eleanor comes to respect and admire. Instead of being another careless pampered spoiled aristocrat, Daniel is a man who is searching for meaning and purpose. I love that the romance and attraction between the two characters wasn’t just based on looks and the physical. Eleanor and Daniel fall in love because they respected the other’s intellect and abilities. This was a meeting of the minds and heart, not just bodies. I really loved the character of Eleanor and she is someone who’d I want as a friend in real life. She is hardworking, ambitious, talented, loyal, and takes pride in her work and all that she has accomplished. She is proud of building The Hawke’s Eye from almost nothing, and will not allow anyone to insult or dismiss it, even Daniel. I liked that this book actively celebrates women’s ingenuity, creativity, and perseverance in a society that almost actively goes out of its way to stymie and stifle them at every turn. The relationship between Eleanor and Daniel was great. There is a slow burn as they both deal with the obvious chemistry and attraction between them. It was interesting to see how both dealt with it. While Daniel rather quickly comes to accept his feelings and becomes determined to be with Eleanor, no matter what, Eleanor has more doubts. Eleanor hasn’t had anything permanent in her life that she hasn’t built herself, that couldn’t be yanked away at a moment’s notice. It becomes very difficult for her to reach out and depend on anyone but herself. However, the way Eleanor comes to see that the leap of faith is worth is was truly lovely. I like that to the end, Eleanor and Daniel decide to be the master of their own fates, to shape their own lives the way they want, to what makes them happy instead of what society expects of them. One of the aspects of the book I enjoyed was that the author writes from a specific and definite point of view. Leigh discusses gender identity and politics, class, and privilege, and sharply questions and criticizes societal norms that disadvantage Eleanor for simply being who she is, while elevating Daniel for the exact same reason. For example, when Eleanor disguises herself as a man and Daniel is coaching her on how to pull off the deception, Eleanor notes the immense difference in carriage and attitude. Men are taught to take up space, stride and act as if they own the world. Women, by contrast, are restricted (sometimes literally by the clothes they wear) and are taught to shrink themselves and be as inconspicuous as possible. But instead of ramming the message down our throats, Leigh frames it as a learning opportunity. Daniel learns to question his beliefs and assumptions as his eyes become opened to issues he’d never considered before. 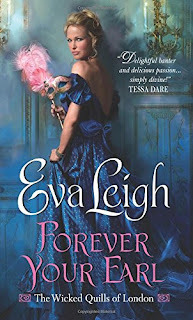 I recommend Forever Your Earl to anyone who enjoys smartly written romances with strong heroines who aren’t afraid to blaze their own path and create their own futures, and heroes who steadfastly refuse to give up despite the odds. I not only loved the characters and story, PJ; I also thought the writing itself was superb. One section I reread several times just to appreciate the crafting of the sentences was the juxtaposition of Eleanor in the theater being disguised and Daniel in his club. Even the difference in the rhythm of the sentences reflected the differences in their two worlds. Amazing! I'm hooked on the series and on the writer. I've had my eye on this for awhile now and am hoping to read it soon. This sounds really good - thanks for the review. I loved it too, Janga. It's on my Best of 2015 list and I can't wait for book #2! Connie and catslady, I highly recommend this book! Eva is a new Author to me. This sounds really good!! Thank you for the review, Lisa. This sounds like a book I will thoroughly enjoy. Good writing and well presented and developed characters make a big difference in how well I enjoy a book. This one is sure to please.